1. 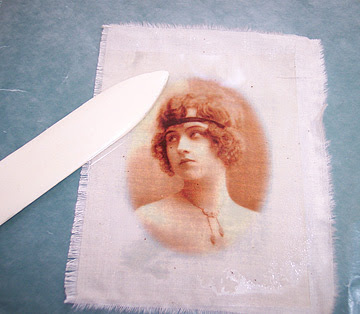 Print out your image on the rough side of an inkjet transparency. Prepare the receiving cloth, ironing it flat if needed. 2. 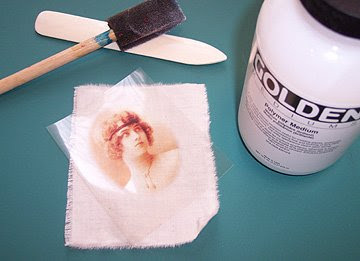 Apply a thin but thorough layer of polymer gloss medium to the fabric. Position the image and burnish it well. The fabric will probably be slippery, so hold your image down carefully. 3. Remove the transparency carefully, and top the image with matte medium to cut the shine if desired. Copyright 2007 Cyndi Lavin. Not to be reprinted, resold, or redistributed for profit. May be printed out for personal use or distributed electronically provided that entire file, including this notice, remains intact. If you heat-seal this with an iron, will you be able to wear and wash? For example, on a tshirt? Also, if the shirt has some stretch to it, will the image crack like transfer paper? What brand of tshirt transfers do you recommend? I have always had mine fade and/or crack off. I am looking for some information about transfers and what is the largest size of transfer paper you can buy? I am doing something so different for our 30th Anniversary SDAEOP conference in June. I crocheted an afghan, red, white and blue. Very simple, but a very heavy one. Soft. I used a Q hook, with Homespun yarn, crocheting two skeins at once. I want to put our logo on some type of fabric, which will be large enough to also use a bit of filler so the logo will puff up a bit when sewn on the afghan. Suggestions for fabric that will sew easily to an afghan? Since transfer paper has to fit through a printer, you're going to be limited by how big a printer you have access to. Same goes for direct printing onto treated fabric, which comes in cotton and silk. I'm not sure this would be the best option for you if the logo needs to be really big, unless you wanted to do it in sections. 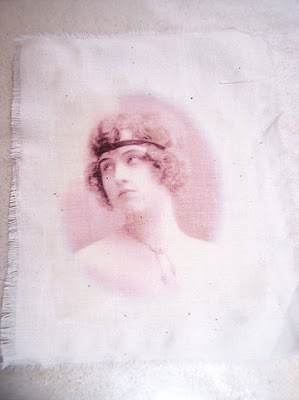 Couldn't you just sketch it directly onto fabric and use fabric paints? Then you're not limited by size at all. Could this method be used to transfer an image onto primed canvas or canvas with layers of acrylic paint? You bet! But you'd have to put down a fresh layer of medium to transfer onto. It works, but it leaves a really stiff section of fabric, so it would be difficult to sew through it later. I like the transparency method because I'm often adding more stuff later, and even though it stiffens the fabric, it's not *too* bad!